drop by to see all the beautiful mosaics. includes OvenServe and Fiesta, with one exception. Can you locate the one that doesn't belong? Thanks for coming by for anther Mosaic Monday here on The Little Round Table. Gorgeous pieces! I love the center photo, great table, love the blues! What a pretty mosaic. 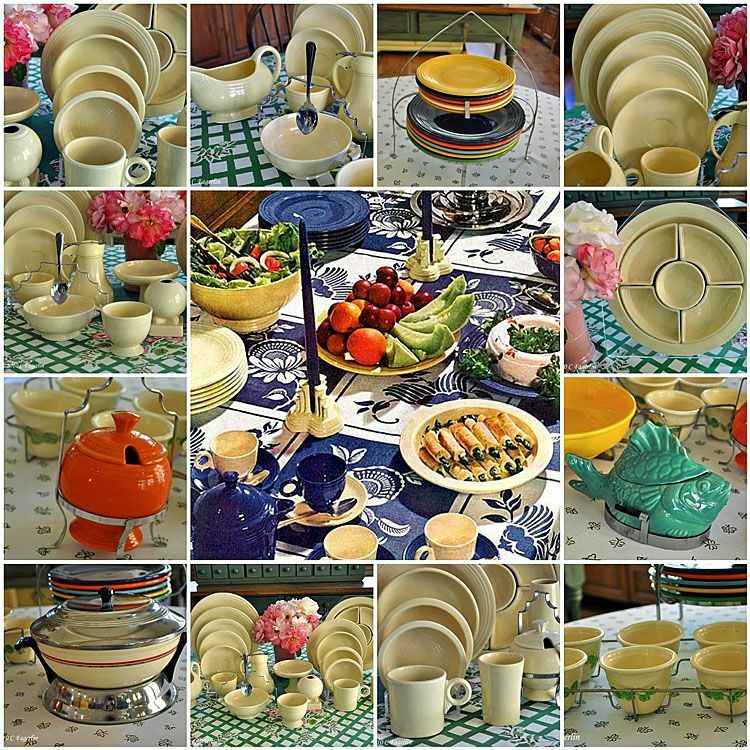 I love all the cream ware. Your table settings and varieties are amazing! A very colourful and well arranged tablescape. I am in awe of how to arrange things on a table. And you made a wonderful mosiac of it too. Oh Candy...more than a few of my favorite things! Divine! This is so pretty! I love the combination of all those pretty dishes. That tablecloth is so pretty too. Is it the fish that doesn't belong? Pretty collection, nicely arranged and mosaic-ed. Yep, it's that FISH baker that doesn't belong! Thanks for all your wonderful remarks and I should have noted as I did on the Vintage Thingies post from last week, that the center photo is a vintage image taken by Margaret Bourke White from the Delineator Magazine in 1936. The rest are from my collection.